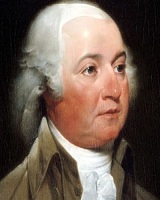 John Adams 30 October 1735 4 July 1826 American John Adams Susanna Boylston Politician, Lawyer The first vice president of the United States and the second president. In 1774, he served on the First Continental Congress and helped draft the Declaration of Independence. A list of popular john adams quotes are given below.